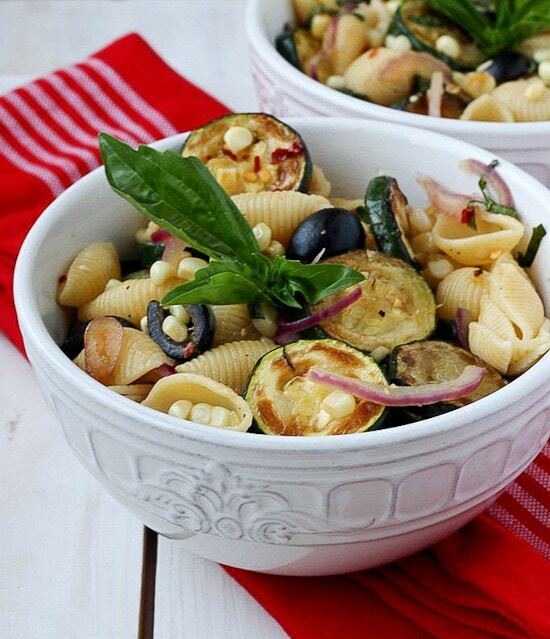 This warm pasta salad is big on summer vegetables, corn and zucchini, with a small kick of red pepper. A great sub to potato salad and a perfect meatless entree or side dish for your next picnic or family potluck. I absolutely can not turn down a good pasta salad on a hot summer day. 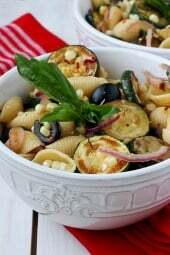 Some of my other favorites are Chilled Italian Shrimp Tortellini Pasta Salad, Summer Pasta Salad with Baby Greens and Summer Macaroni Salad with Tomatoes and Zucchini. Please enjoy this guest post from my friend Olga of Mango & Tomato. 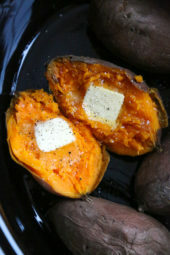 Olga is a culinary wiz and I’m happy to have her share a recipe with all of you here on Skinnytaste! Hi! My name is Olga and I’m the creator of Mango & Tomato, where I’ve been sharing my original recipes, restaurant reviews and food photography for the last four years. Through blogging I get to tell my readers about my childhood food memories, how travel influences the food I make today and my favorite places to eat out. Most importantly, though, I get to meet the other people who are passionate about food. Mostly, these “meetings” happen through social media, but in rare cases I’m lucky to meet them in real life. Gina, is one of those people: we met during a trip to the POM Wonderful orchards and have stayed in touch ever since. I’m psyched to be able to share a recipe with you all on Gina’s blog! Heat a tablespoon of olive oil in a large non-stick skillet. Saute zucchini for five minutes on each side. 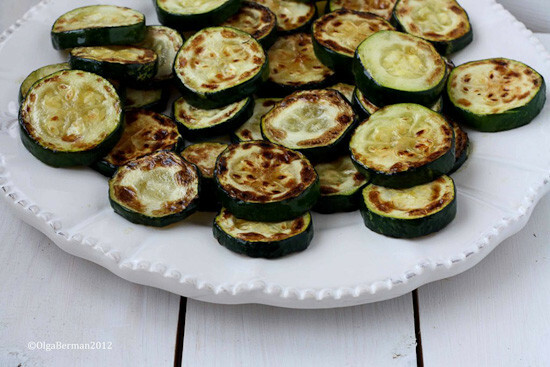 You might have to do this in several batches to ensure that zucchini is cooked in one layer. Remove zucchini from the skillet and set aside. 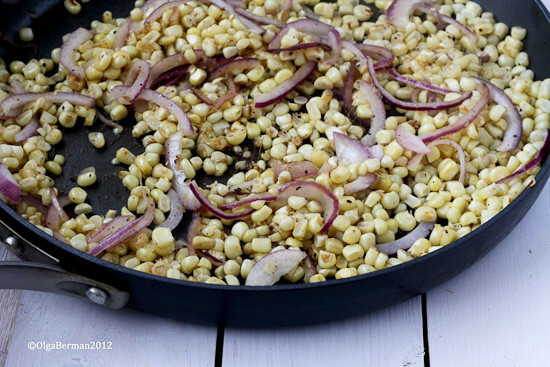 Add the remaining teaspoon of oil, corn and red onion and saute for five minutes. Combine slightly cooled pasta with the remaining ingredients. Serve this dish hot or at room temperature. It keeps well in the refrigerator and makes excellent leftovers. I made this again and I love it! Thanks so much for sharing! I made this last night. It was really good…hard to stay away from it after I reached my WW point limit. Thanks so much for sharing. How many cups is 8 oz dry pasta? Delicious! We had this as a side for dinner tonight and the entire family loved it. I've made tons of your recipes and this is one of my favorites. My husband ate 3 servings! How do you think it would taste if I added a can of white beans next time? My 10 years old granddaughter made this for dinner. We loved it. Thank you for all your wonderful foods you've brought into our lives. I am gonna make this tonight with my last farmer's market haul. I was thinking of adding some garbanzo beans to it as well. I made this last night – added a bit of olive oil as well and some parm cheese at the table. Delicious! Also, the onions were so good, I will double or triple them next time! Couldn't have been more pleased! Thank you so much! YUMMY! This recipe is awesome!.Tuna and pasta bake create your pasta food instant and testy. Newly added pasta cooking tips which save your time and energy.Easy and healthy recipe for making tuna pasta instantly. Know full pasta recipe step by step with instruction. We had this for dinner and we loved it. I used balsamic vinegar and added a sprinkle of parmesan cheese. It was light and perfect for summer. Thanks so much! Carolyn and Robyn, so glad to hear it worked for you. Yes, cheese is a delicious addition and I thought of it but knew it would not pass Gina's requirements 😉 I also added a bit of mayo to mine! Made this last night and we loved it. I added some Romano cheese to it and it was awesome! 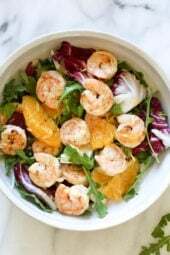 Great recipe, thanks for posting! Perfect timing – I had some squash that needed to go, and this was absolutely delicious! Thank you Olga for sharing! I have some zucchini that needs to be cooked now or never, so I am so glad I stumbled upon this! I can't wait to make this tonight. I've eaten way too much junk food at work today, and I'm looking forward to this as a light dinner tonight. This looks awesome, I can't wait to try it. Especially since I have some zucchini that needs to be used up. Also, I tried your blueberry poppyseed muffins last week and they were fantastic!!! I'm going to try making them again and omit the blueberries just because my son isn't the biggest blueberry fan. The browned butter makes such a difference, you can really taste it. If i were to do gluten free pasta what would the points plus be for that? I'd have to calculate to be sure. thanks for the great summer recipe! please email me and I will forward the email to print friendly support. This is lovely, Olga! I am going to salad potluck this week and I think I may have to make this. Gorgeous! I cooked this recipe tonight, because I already had zucchini and big bag of bulk farfalle tricolore. Every bite is magnificent! Thanks Gina & Olga. 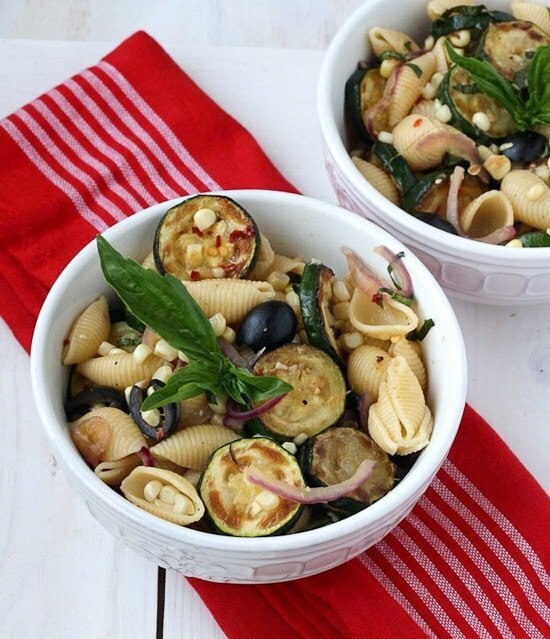 Really like the idea of a warm pasta salad! I bet the corn goes really well with the more Italian flavors here. I guess you add vinegar, olives, basil at end? Almost ready to eat! Yup, where it says to combine the pasta with 'remaining' ingredients. I used sweet basil since it's what I had on hand, and balsamic vs. white vinegar – turned out scrumptious! Going to make it again with white, to see which way we like it better. Didn't last long in this house! YUMMY! This recipe is awesome! Every single recipe looks and is so yummy. So happy to hear that! I think the towel was something I picked up in Target on clearance. When do you add the white vinegar? At the very end. It adds a bit of acidity and brightness. This looks wonderful! 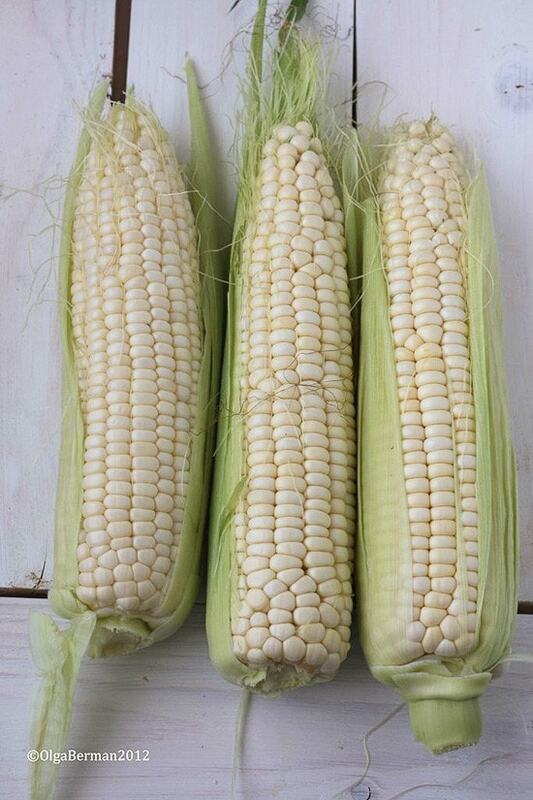 I just picked up some fresh zuccini and corn from the farmers market! 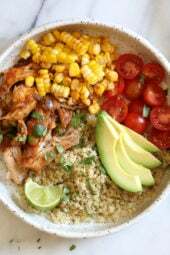 I'm a huge fan of leftovers so I'll definatly be making this for my husband and myself to take for lunch! Thanks for the recipe Olga! Oh my word this looks delicious. Makes me want some zucchini! This looks delicious. Can't wait to try it! YUM! Can't wait to make this for a family reunion so I know I have something healthy to eat! I love that you are doing Meatless Mondays, my vegetarian daughter will love this with whole wheat pasta. This looks amazing! Put this right into Evernote for future use!